Growing up in New England, your MatchGirl was surrounded by braided rugs. It has been a long time since I have given them any thought. 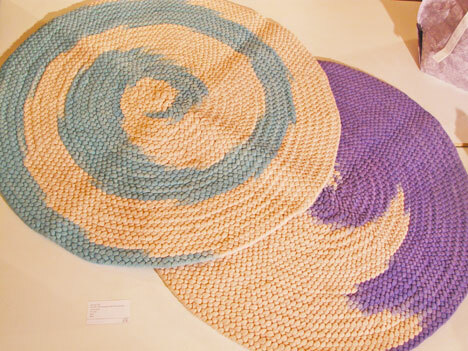 As a little girl, I would lay on the rugs in our house and marvel and the braids and the mixes of colors, but in our house, and in the nearby houses of my dairy farm pals, the braided rug was very much a utilitarian item. This week has been design week in New York and while perusing Core 77 to check in on the cool happenings and the new designers to pay attention to in the future, I came across the the work of Tim Liles, who is making traditional braided rugs in a whole new way. This, of course, gentle readers, got your crafty MatchGirl thinking ... couldn't Boyfriend and I just make our own awesome braided rugs? As someone who, when properly settled, likes to spend a lot of time sitting at a sewing machine and amongst bins upon bins of fabric, I don't think this project would be that difficult. While they are a little less modern than your MatchGirl's normal design aesthetic, Boyfriend really likes arts and crafts inspired stuff, so perhaps by making our own, we will be able to find a happy medium?